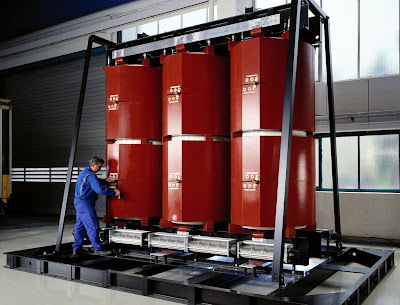 Above shown picture was the world's largest cast resin transformer developed by Siemens power transmission and distribution at a power range up to rated of 40 MVA, it has 4.8 meters long, 2-8 meters wide, 4.7 meters high and weighing of 50 metric tons. Its answer the question how this transformer made up from birth to complete. You will able to learn the transformer characteristics, reduced cost, maintenance free, power reserves, planning flexibility and safety and reliability, design details, the high-voltage winding and low voltage winding, core and coil clamps. It reduced transmission losses, approach for analysis, schematic example.